No one does a better job in removing snow faster than a best snow blower. 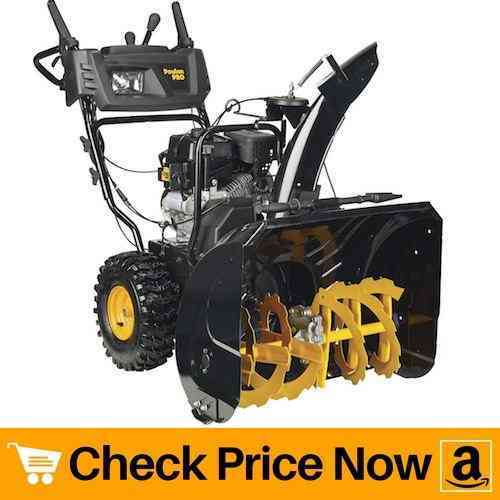 Not only it saves your time, but it also reduces hassle of clearing snow from the path. Snow blowers are must to have if you live in an area receiving high amount of snowfall. As huge amount of snow makes it difficult to walk, it becomes necessary to remove it. 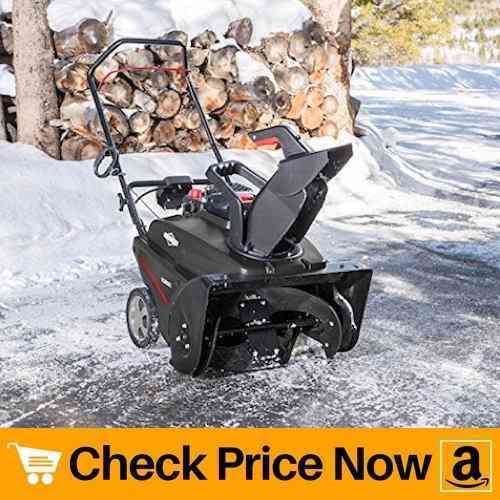 So here we are with our best snow blower reviews in order to help you find a perfect model to remove snow this winter. Apart from throwing out white thick bed of snow, you can also use indoor space heater, outdoor propane patio heater, or use fire pits to keep your self warm. Broadly, snow blowers are of three types: electric, cordless and gas snow blowers. Therefore, the amount of snowfall your region receives decided which type of snow blower will work best for you. Generally, high snowfall requires a powerful unit to throw away snow such as gas snow blowers. Whereas, electric snow blowers are best in removing light to moderate amount of snow. Each one of them have their advantages as well as drawbacks. We will discuss about the same in the buyers guide section present at the end of the review list. As of now, we have included all three types of model in our best snow blower reviews. 14.1 1. Single stage vs two stage snow blower? 14.2 2. What features to consider before buying snow blower? Nothing is best than an electric snow blower which is light in weight and easy to maneuver. And this snow joe snow blower is perfect to clear light to medium snow from pavements and driveways. Its wide 18-inch clearing head effectively clears the area within short span of time. Also the 10 inch depth of the head removes fluffy as well as wet snow easily. Further, the powerful motor of the unit have capacity to move up to 720 pounds of snow per minute. Presence of scrapper blades at the bottom of this snow joe electric snow helps to collect the snow easily. Therefore, it eases work, prevents damage to the surface as well as saves time. Simple electric start of this snow joe electric blower eliminates hassle of pull-start. This in turn, reduces maintenance cost as well as saves time. Apart from that, you can adjust the discharge chute up to 180 degrees by simply rotating chute crane. This rotatable chute posses capacity to throw snow up to 25 feet. Plus the on-board chute clean out tool helps to clear the snow jam in case it gets clogged due to heavy and wet snow. Speaking of the construction, this electric snow blower from snow joe is strong and sturdy. Soft grip in combination with fold-able handle allows you to work for long period of time. Besides that, presence of led headlight on the front of machine gives you clear view of the snow ahead. Thus, making it best electric snow blower for the price. Turn the machine off for a while after 20 minutes of continuous usage. This will ensure performance of motor remains intact for long period of time. Moving ahead, we have a brilliant two stage snow blower from husqvarna. A well known brand. husqvarna manufacturers excellent products to ease your work. And here is one its top rated snow blowers with powerful cc engine. If time is a barrier and you wish to clear a large area in short span of time, then this model is best. Despite being costly, husqvarna snow blower quickly throws out huge amount of snow. 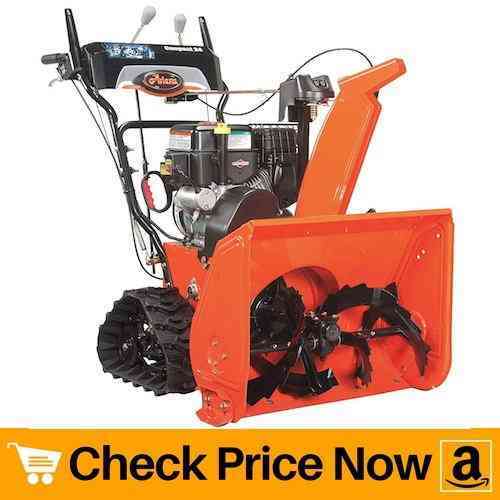 This is due to its 2 stage feature that effectively collects snow up to 2-12 inches. Therefore, making it suitable for regions receiving heavy snowfall. Though Husqvarna ST224P runs on gas, it comprises of electric start. Not only does it saves your valuable time but also reduces effort to start the engine. You can simply start the engine by pushing a button. Apart from that, this device comes with power steering. Its six forward speed gives you complete power to manipulate speed setting. However, this might seem a lot for a snow blower but it really does great job in removing deep snow. Surprisingly, it also contains a reverse gear which further eases your work. Overall, design of this husqvarna snow blower is attractive as well as controls are easy to operate. Besdies that, two 15 inch types easily rolls over heavy snow and cuts down need to push the device forcefully. Interestingly, this unit offers adjustable shoes. Now this feature allows you to adjust the distance between ground and blades for thorough cleaning. Heated grip handles in accompany with easy controls makes it best gas powered snow blower. 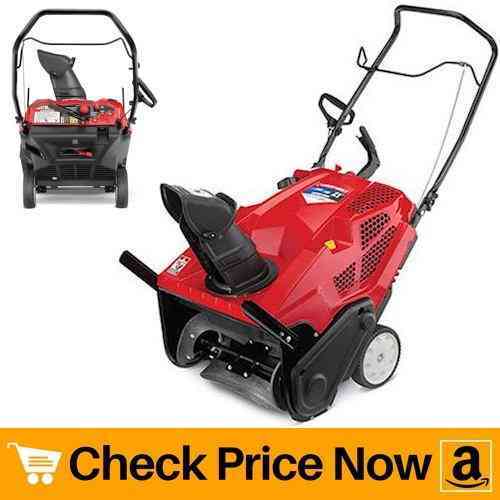 If you wish to work on relatively medium area then this gas snow blower from briggs and stratton is best. Similar to above two models, this unit also have easy electric start and headlights on front side. In addition to that, by using electric chute rotation button you can change its direction from left-to-right. This button is present near the top of the handle bar so that you can easily operate it. Also the oversize controls on the top panel allows you to operate them easily wearing mittens. Let us focus on what other features makes it one of the best snow blower in the list. First of all, it is a single stage snow blower. These type of models are ideal for removing light to moderate snow. Obviously, presence of single stage does not make engine powerful enough to throw out wet and deep snow. But on positive side, it posses maximum snow throwing capacity up to 30 feet. Along with that, wide clearing path collects descent amount of snow in matter of minutes. Secondly, putting all the parts together hardly requires 15 minutes. Hence, easy assembly and simple start makes it best snow blower in the list. Snow-shredder serrated steel auger at the base effectively chops the ice as well as collects it. Further, the auger clears snow down to the pavement and helps to drive snow thrower forward. Also the two wheels on back side of the machine makes it easy to move it around. However, it you wish to work with an electric unit, than the company also offers standard electric model. Otherwise, this is best snow blowers in terms of money, features and construction. Proudly manufactured in united states, this product from arines is one powerful electric snow blower. High quality material and construction makes us include this product in our best snow blower reviews. This compact snow blower is powerful enough to blow away huge amount of snow in short span of time. No matter what form of snow is, fluffy, deep, wet or hard-packed, this machine effectively clears your path. 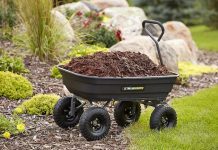 Its performance not just remains limited to paved surfaces but it works excellently on uneven surfaces. 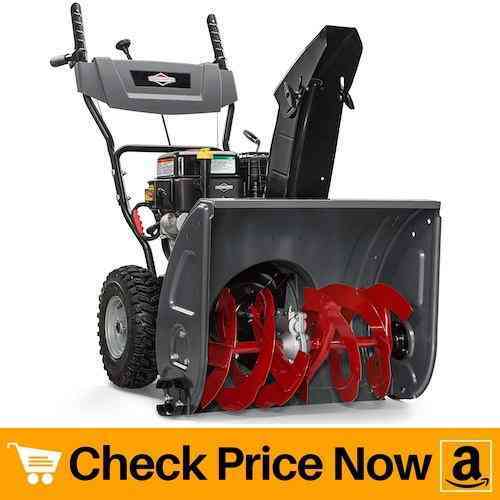 This 2 stage snow blower features a solid axle with 5-1/2 inch wide directional track drive. This in turn helps to remove snow from sloppy and slippery areas. Apart from that, you can set the speed according to the depth of snow with 6 forward speed options. 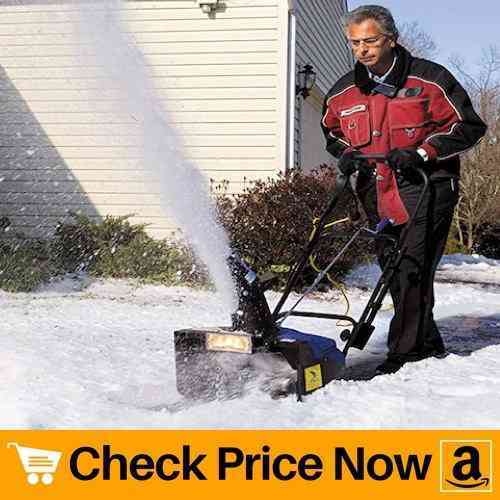 This compact ariens snow blower posses capacity to throw snow up to 40 feet. However, wet and hard-packed snow might not go this far. But not many big models have offers such throwing capacity which makes it one of the best snow blower. Compact design of this product requires less storage space. However, in our opinion, despite its small size, the unit is heavy. Do not worry about moving the device, as it contains track drive instead of wheels. One major flaw in the design of this product is, turning the device is difficult while in use. Although, after several uses you will get familiar to its moving style. A small snow blower is exactly what you need in case you have less storage space. So is this space-saving product from troy-bilt. Despite being small in size, this gas powered snow blower have a powerful engine which works on single stage mechanism. It covers wide width along with clearing snow up to 13 inches deep. Thus, making it best snow blower in compact size. Other than that, it also posses capacity to throw snow away at a good distance. However, hard-packed and wet snow might not reach very far but that is obvious. Unlike other gas operated blowers, this unit is light in weight. Therefore, you can easily move the device on pavements, driveways as well as sloppy surfaces. In short, this device will effectively clear the ice on almost any type of surface. One more interesting thing about Troy-Bilt Squall 2100 208cc is its cost. 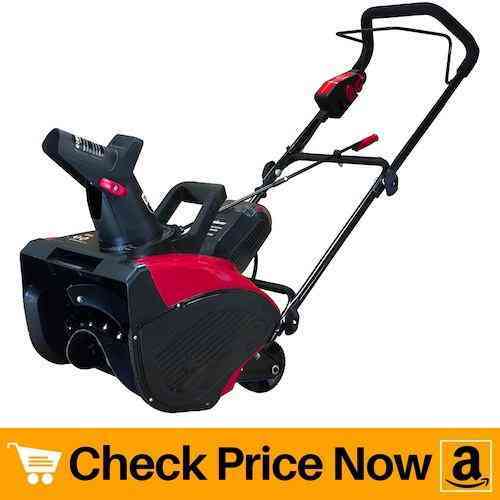 This Troy-Bilt Squall 2100 is cheap/a as compared with other brands. Thus, making it one of the best snow blower in our review list. Easy to control chute rotation for optimum snow displacement allows user to change the direction according to the need. In addition, the gull wing handle makes the device more comfortable to move around. Besides that, it hardly takes 15 minutes to put all the parts together. You only need to attach thrower and handle as rest of parts comes pre-assembled. 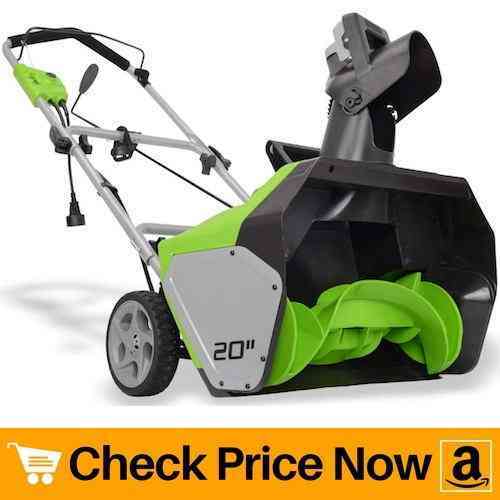 If you are low on budget and still wish to have a good snow blower that can effectively throw off the snow, then here’s a product from greenworks. 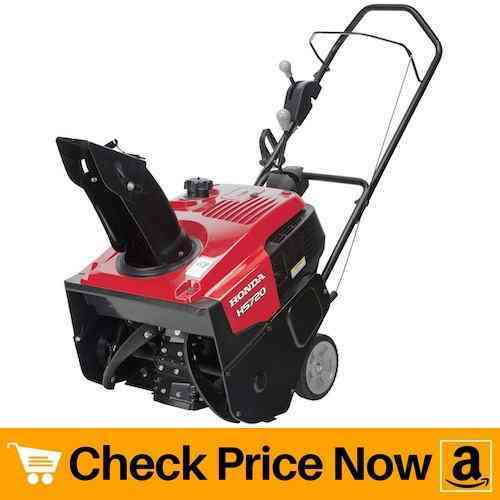 This low maintenance electric snow blower requires no oil or gas. Simply just plug in the cord and remove snow from our patio, driveway and walkway. Small size of this unit requires very less space for storage. As the unit is compact it does not weight much. As a result, it becomes extremely easy to use and move the machine around. Even it is beneficial for the people suffering from back pain as they do not need to put extra pressure to move the whole unit. 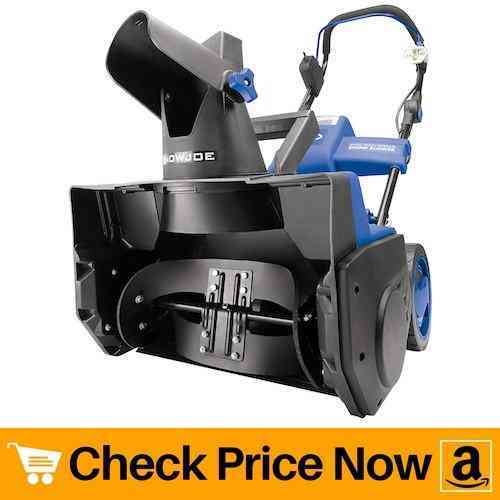 Hence, making it one the best snow blowers in our review list. One downside of this product is, it does not contain headlights. But greenworks does offer a similar product containing led headlight. Both of the models are similar with only one difference of led lights on front panel. Apart from that, it have maximum snow throwing capacity up to 20 feet. You need to adjust the direction of chute manually which is easy to perform. And less electric control means less hassle. However, it does contain electric start in order to start the device easily. With total power consumption of 120 volts, this snow blower gives excellent output. This electric snow blower generates less noise as compared to other electric models. And as a result, removing snow becomes more fun when the device does not generate annoying noise. Conclusively, it is a cheap, light weight and powerful small unit especially to remove snow in small yards. Next on our best snow blower review list we have a cordless snow blower. Main advantage of using a cordless snow blower is, the device does not remain bound to cord length. You can freely move the unit anywhere without worrying about cord length. Further, this cordless snow blower have battery life of 25 minutes. This much time is enough to clear snow in your patio, pavement or driveway. Plus the 2200 rpm speed along with wide clearing path helps to collect snow at fast pace. Therefore, small size and light weight of this battery operated snow blower serves its purpose well. 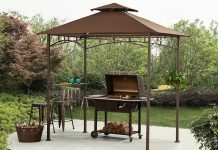 Similar to other models on the list, this unit also features fold-able handle and 180 degree chute rotation. However, you need to adjust the direction of chute manually which is very easy to perform. The handle for rotation is present just below the main grip of the unit for your convenience. Plus its outer coating of foam makes it comfortable to use with mittens. Despite being a cordless snow blower, it has capacity to throw snow up to 30 feet in distance. Thus, it is compact yet powerful device. The rechargeable battery takes maximum 70 minutes for full charge. Further, the charger is comes with back slots for wall mounting. You can simply mount it on the wall of your garage. Besides that, the steel auger is rubber-tipped and will not cause damage to your patio floor while clearing ice. Hence, making it best cordless snow blower for patio. Here comes another product from gas snow blower from Briggs and Stratton. This powerful 2 stage snow blower removes heavy, deep and wet snow in matter of seconds. As it have dual stage of working, body of the unit is big which makes it heavy. But not worry about its weight, as it contains wide wheels along with friction disk drive system. As a result, it handles the weight of the product as well as helps to remove snow in sloppy surfaces. 9.5-foot-pounds of torque in combination with high power engine makes it best two stage snow blower for removing heavy snow. Electric start using simple push button smoothly starts the engine during cold weather. In addition to that, the steel reversible skid shoes makes plowing through the snow easy. By this way, you can clear lot of snow in less amount of time with less effort. Further, the left side crank rotation and manual chute deflector makes it lot easier to maneuver device on heavy snow. Also one downside of this device is, its handles are not that comfortable to use. It becomes hard to keep grip on handles wearing mittens especially on sloppy surface. Wide clearing width along with steel scroll auger chops the snow nicely before throwing it out from the device. 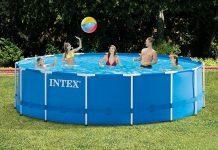 Plus it have great capacity to throw snow up to several feet. And to keep its performance intact, do not mix oil with gas and make use of non-ethanol gas. In case, you do not like to deal with manual chute operation, the company offers similar model with remote chute controls. This is a best snow blower if you love to handle things manually. Most of its features needs manual operation. The reason why we included this unit in our best snow blower reviews is because many people do not prefer to operate fully electrical device. It might be due to electric connections get loose over time and the blower becomes a piece of junk. Thus, they like to perform all operations by themselves. And this two stage snow blower from yardmax gives excellent output when it comes to clear snow. Yardmax offers multiple speed drives that includes 5 forward and 1 reverse speed. Easy to change the gears, this two stage snow blower can efficiently clear snow up to 16 inches deep. It has enough power to clear heavy-packed and wet ice without much effort. Therefore, which makes the device perfect to use during heavy snowfall. Plus the serrated steel augers at base chops off the ice thoroughly in order to give you smooth output. To make the product long-lasting, Yardmax features aluminium gear case with alloy steel gear. In addition to that, synthetic gear oil extends performance of the machine as well as maintains engine health. Recoil start is a breeze as you need to set the knob and a single pull will start the engine. Lastly, the company offers another model having same features as of this one with only difference of clearing width. Next on our best snow blowers list we have another product from snow joe. This cordless snow blower is specially designed to clear snow present on paved surfaces. Being light in weight makes the unit easy to move around. It is so light in weight that a kid can also easily move the device. Furthermore, it consists of brush-less motor. This in turn generates less noise while offering more run-time. Not only it helps to work for long period of time but it also makes working more fun because of no annoying sound. This battery operated snow blower comes with battery and charger. On full charge this unit can run up to 52 minutes continuously. Apart from that, it consists of chute remote switch right near handle to easily set its direction. Bright headlight on front panel gives you freedom to work during nighttime. Plus the steel auger with 2 rubber blades efficiently moves up to 500 pounds of snow per minute. Ultimately, you can clear good amount of area in less time. A simple push button instantly starts the device. Plus the adjustable handle adds more comfort while working. One more interesting thing about this model is, it is Eco-friendly. And by that we mean, the machine does not emit carbon. 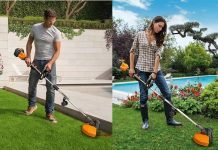 So conclusively, it is a quiet, light-weight and environment-friendly cordless snow blower. This gas powered, single stage snow blower is easy to assemble and start it right away. Honda have a good name when it comes to design of engine. They manufacture sturdy and powerful engines that lasts for years. Speaking of which, this compact unit is best suitable to clear medium to hard snow. Unlike other models, it does not have push button start. But it engine starts off easily within maximum of 1-2 pulls. And this easy starting of the engine makes it one of the best snow blower in our review list. Its semi-self propelled auger drive and 4-stroke engine are responsible for smooth operation of the device. Also the maximum throwing capacity of this unit is 33 ft. Therefore, you can easily clear ice from paved surfaces with great snow displacement distance. Even this displacement distance does not reduce while moving hard-packed and wet snow. So conclusively, this is best single stage snow blower for areas receiving heavy snowfall. Similar to most the snow blowers on the list, thus unit also have wheels on back for easy movement. Plus, convenient location of remote chute control makes it easy for you to set the direction of deflector. Overall, it is a small unit which is smooth to operate and is tough while clearing snow. Our best snow blower list ends with a powerful 2 stage snow blower. This brand is not quite popular but it will definitely impress you with its excellent features. Its robust engine is meant to clear heavy snow. And with power of 2 stage, you can easily remove snow in large area within minutes. Furthermore, power steering allows you to operate the unit using one hand. To make the task of removing snow more fun, it offers comfortable grip loops. This in turn, helps to keep device more stable while pushing or pulling. 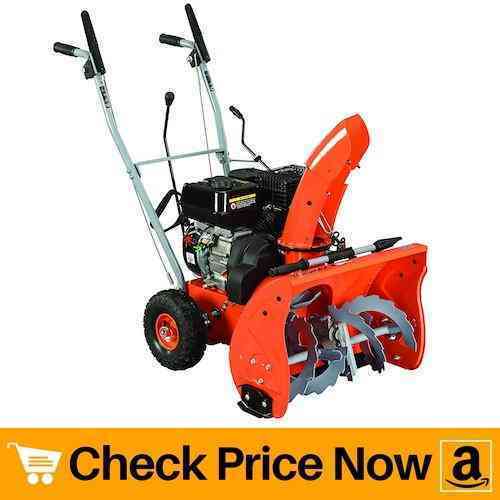 This two stage snow blower offers 4-point adjustable height handles. Now this feature is important when you use the device over different surfaces. Not just it helps to clear ice effectively, but it also prevents surface from getting damaged. Further, bright headlights on front helps to work during nighttime. One more attractive feature of this snow blower is, its heated hand grips. And heated handles simply adds more comfort while you work. 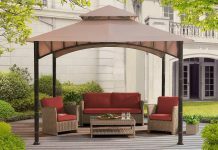 Sturdy and rust-resistant metal framework of the body is long lasting. The powerful ribbon augers effectively chops off hard-packed ice. This helps to clear large area in short span of time as well as prevents choking. So conclusively, it is a powerful, strong and sturdy gas snow blower ideal for driveways, sidewalks, large paved and gravel areas. 1. Single stage vs two stage snow blower? Buyers often ask difference between single stage snow blower and two stage snow blower which in our view is quite obvious. In your quest of buying a best snow blower, you might know the basic difference between both the models. Before mentioning the differences, we might like to add a point. The point is, majorly gas snow blowers are available in different models and gives excellent results. Now let us begin with the differences. These type of units are light in weight and are best for removing snow in small-to-medium areas. Single stage units are compact which makes them easy to handle. They are more suitable for use on paved surfaces and should be avoided on gravel areas. Can remove snow up to 12 inches deep. Two stage units are heavier as compared with single stage models. These type of models can remove snow up to 24 inches deep. Such models are comfortable to use on sloppy areas. Snow throwing capacity of two stage model is more powerful than single stage units. Wide clearing path of these models removes snow in short period of time. 2. 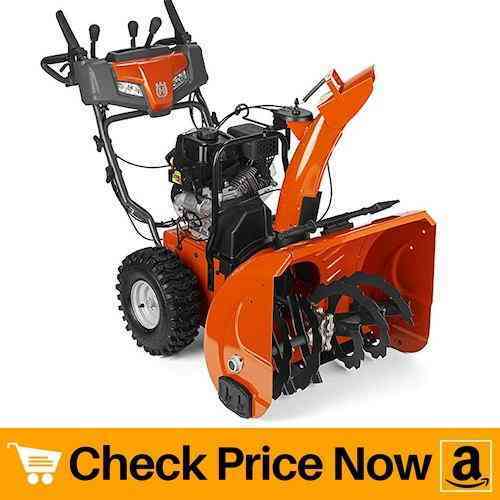 What features to consider before buying snow blower? In order to get a best snow blower, you might look for certain features that will make working more comfortable. In our opinion, you should look for below points before buying a snow blower. 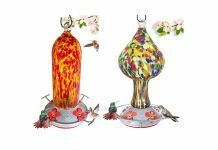 Type: Generally, 5 types of models are available: single-stage, two-stage, three-stage, electric and cordless. Choose the most appropriate model depending upon clearing area and amount of snowfall your area receives. Headlights: If you like to work during nighttime, make sure the model you choose contains powerful headlights. We have included products containing headlights on our best snow blower reviews. Speed: For best results, select a model having option of both forward and reverse speed. Handle: Good output comes when handles are comfortable to hold. Many snow blowers offers heated handles so that you can work comfortably in chilly weather. Therefore, choose a device that offers such feature. Chute Rotation: Now this feature depends upon your preference. Many people like to control direction of chute electrically whereas some prefer to do it manually. Both of them have their advantages and drawbacks. And for your convenience, we have included both types of model in our best snow blower reviews.